In a peristaltic metering pump—a type of positive displacement pump—fluid is pumped through a flexible tube in a peristaltic motion. Rollers are attached to a rotor that is controlled by a motor. As the rotor turns, the rollers pinch the tubing to force the fluid through. When the tube is not compressed, the fluid flow is brought into the tube. Peristaltic metering pumps excel at pumping dirty fluids that contain particulate matter into lower pressure systems because they have no check valves to clog. The gentle forces created during the peristaltic pumping action do not damage delicate fluids within the tube. In contrast, diaphragm metering pumps include check valves in the suction and discharge side of the pump head. If either set of check valves becomes fouled, the pump will not meter accurately, and loss of prime may occur. 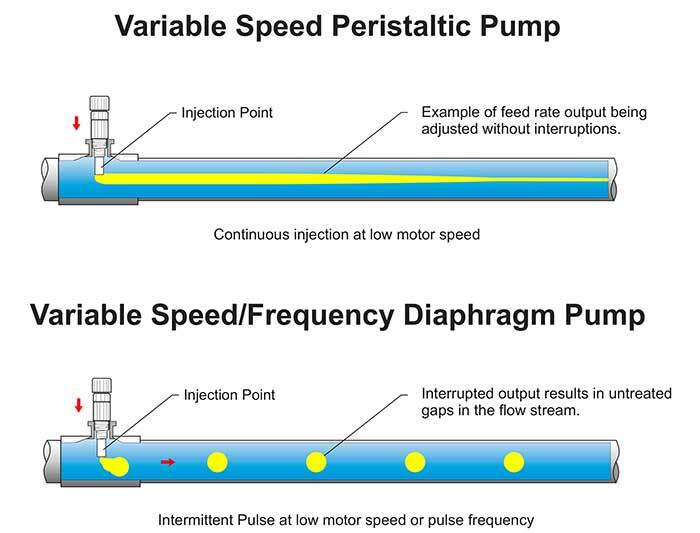 Diaphragm pumps may create shear stress on fluids, particularly if the pump employs a high velocity stroke action. Peristaltic pumps are also especially effective at pumping fluids that contain trapped gases. Fluids such as chlorine and hydrogen peroxide tend to release absorbed or occluded gases when subjected to a vacuum or to changes in temperatures. 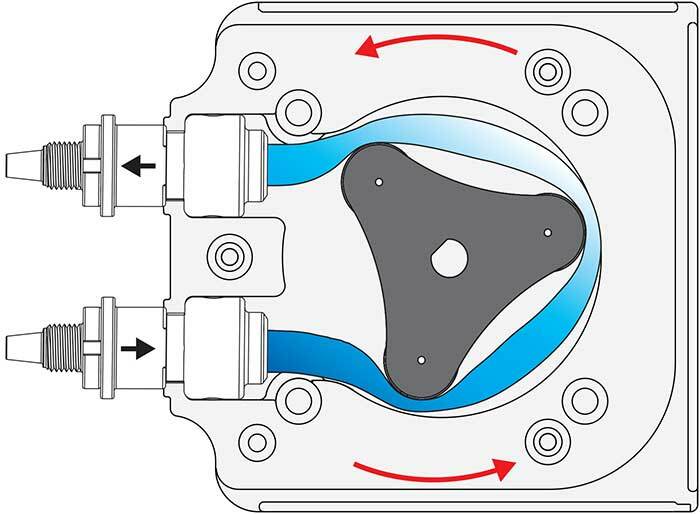 While diaphragm pumps can lose their prime and fail when gasses build up in the pump head, peristaltic pumps can pump both fluid and gas and pump without losing prime. Peristaltic pumps prime under maximum pressure but are usually limited to maximum discharge pressures of around 125 pounds per square inch (psi). They can inject into a vacuum without metal spring-loaded valves, and their output volume is not affected by changes in the system pressure. Alternatively, diaphragm pumps can operate at higher system pressures but require the addition of metal spring-loaded valves to resist siphoning. Their output can vary with system pressure changes. A California craft brewery uses peristaltic pumps to for purification of wastewater. The brewery and the packaging hall generate about 100,000 gallons of wastewater per day. A pump was needed that would not vapor lock from the aggressive off gassing from chemicals being injected. The brewery uses two peristaltic pumps to inject 12.5 percent sodium hypochlorite into the membrane bioreactor filter backwashes. A third pump injects 93 percent sulfuric acid prior to reverse osmosis, and an additional pump injects 12 to 14 percent sodium hydroxide to bring reclaimed water to a pH of 8 to prevent pipe corrosion. The peristaltic pumps allow the gas accumulation to be pumped through the tubing while maintaining a constant flow rate without vapor lock. Image 2. Intermittent flow versus continuous flow. An energy company in Florida needed pumps to inject 12.5 percent sodium hypochlorite into reuse water to prevent biological buildup within the water tubes of their condenser. Any buildup in the condenser would reduce efficiency in the production of steam, therefore creating less mechanical power. The company chose a dual peristaltic pump skid system. The peristaltic pumps were easily installed and maintained their flow without losing prime. When peristaltic pumps are in use, the pump operator must be aware that constant squeezing of the tube degrades it over time, slowly diminishing the feed rate. Most manufacturers rate tubes in hours and the user must keep track of how many hours the pump has been running. When pump tubes are not regularly changed, or the injection point is not serviced, the pump tube may begin to leak. The user must also ensure that the pump tube materials, including the standard fittings (wetted parts), are compatible with the chemicals being injected. Manufacturers will list the materials that make up the wetted parts, enabling end users to determine the chemical compatibility of the fluid they are pumping. Modern peristaltic pumps have more tubing options and offer more chemical resistance and longer tube life than in the past. Peristaltic metering pumps are a good choice when pumping dirty fluids that contain particulates or trapped gas. The constant flow and gentle peristaltic pumping action help deliver precise amounts of chemical to a system without loss of prime. Amparo Burke is advertising manager at Blue-White Industries. For more information, call 714-893-8529, email sales@blue-white.com or visit www.blue-white.com.